My buddy Tony and I have been trying to figure out how to quantify Jeremy Lin’s recent five games. He suggested I figure out the likelihood of his start, assuming that Lin is “just” an above average point guard. 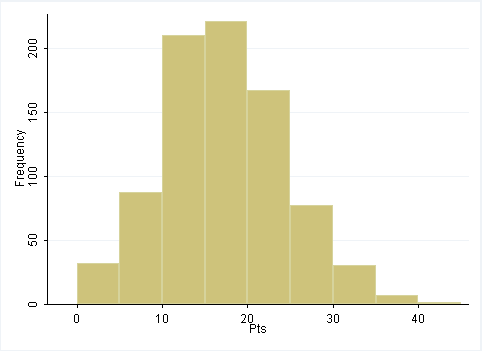 So, I identified all the point guards who averaged between 16 and 18 points per game in the 2009-10 or 2010-11 season. In 2009-10, that included Devin Harris, Rodney Stuckey, Russell Westbrook, Stephen Curry, Steve Nash, and Tony Parker. In 10-11, the list is Brandon Jennings, Chauncey Billups, Gilbert Arenas (before the suspension), John Wall, Raymond Felton (while with the Knicks), and Tony Parker again. In a total of 832 games, these players scored 30 or more points on 38 separate occasions (this is the total of the last three bars on the right). Likewise, they scored fewer than 5 points in 32 different games. These two tails each capture about 4-5% of the total distribution.